For the 24 hours to 23:00 GMT, the USD declined 0.21% against the JPY and closed at 110.43 on Friday. Macroeconomic data showed that Japan’s preliminary leading economic index advanced to a 6-month high level of 106.9 in May, higher than market expectations of an advance to a level of 106.6. In the prior month, the leading economic index had recorded a reading of 106.2. Meanwhile, the nation’s the flash coincident index dropped to a level of 116.1 in May, in line with market expectations. In the previous month, the index had recorded a reading of 117.5. In the Asian session, at GMT0300, the pair is trading at 110.45, with the USD trading slightly higher against the JPY from Friday’s close. The Japanese Yen fell against the dollar, after Japan posted a trade deficit in May. Overnight data indicated that Japan recorded a trade deficit (BOP basis) of ¥303.9 billion in May, following a surplus of ¥573.80 billion in the prior month. Market had expected for a trade deficit of ¥483.10 billion. 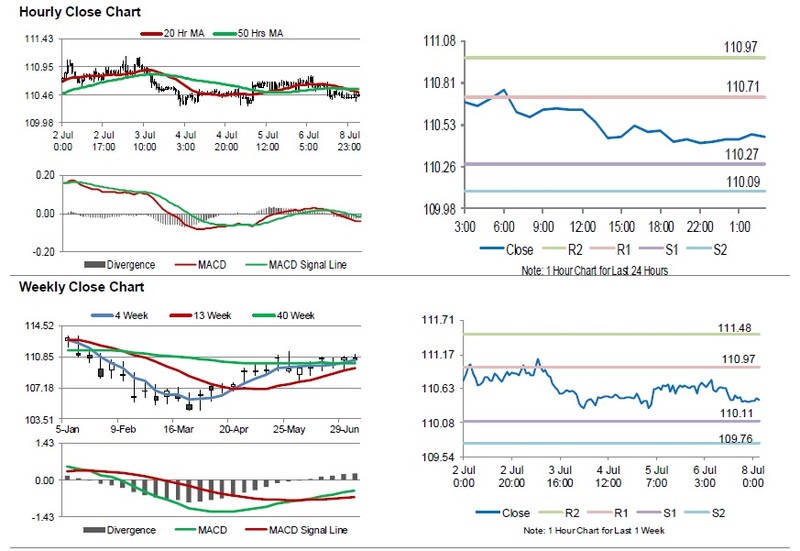 The pair is expected to find support at 110.27, and a fall through could take it to the next support level of 110.09. The pair is expected to find its first resistance at 110.71, and a rise through could take it to the next resistance level of 110.97.